Not yet published. Ships 5/1/2019. La Fontaine wrote some of the most famous fables of modern times, eight of which can be found in this book including "The Hare and the Tortoise", "The Goose with the Golden Eggs" and "The Cicada and the Ant." 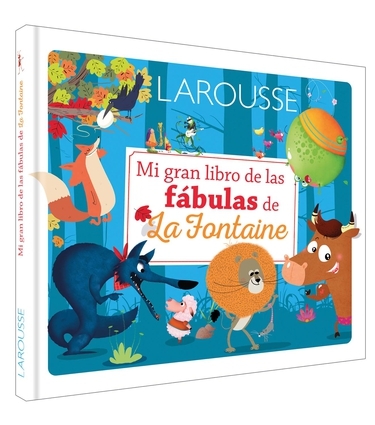 All are accompanied by beautiful illustrations that without a doubt will be loved by all children.La Fontaine escribió las fábulas más famosas de los tiempos modernos, y en este gran libro se compilan 8 de ellas, entre las que se encuentran "L libebre y la tortuga", "La ganilla de los huevos de oro" y "La cigarra y la hormiga", todas acompañadas de bellas ilustraciones que sin duda alguna serán del agrado de todos los niños. Jean de La Fontaine is a poet. He is one of the most widely read poets of his generation. His book, Fables, is considered a masterpiece of world literature and a model for all subsequent fabulist writers.